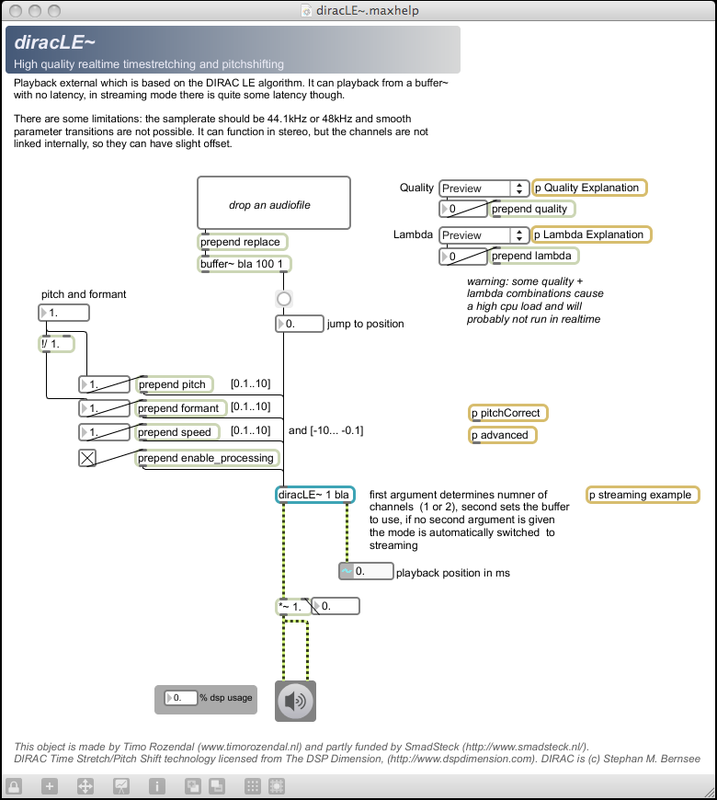 The external is based on the free LE version of DSP Dimension‘s Dirac algorithm. It has some limitations but I tried to squeeze out as much as I could. You can use it to play from a buffer~ without latency added, or alternative you can place it in an audiostream (in this case you have quite some latency, but luckily hosts like ableton live correct for this automatically). The external is free for non-commercial use. Let me know what you do with it! This is amazing. Thanks so much! (using for a time-stretching looper for playing with a band). I’ve been making a realtime sound on sound looper built around DiracLE~ for the past year, and I just uploaded it to maxforlive.com. Researching what can be done in MAX MSP to samples and audio to enhance and support patches for samplers and editing. Only picked up Max a couple of weeks ago at uni and have been set a task to perform sample modulation. We were only walked through a basic buffer controlled by midi / ctlin – dec with groove & keys to loop, however personally I’ve been interested in sound design for a long time perhaps as an extension of composition since my early days at orchestra. 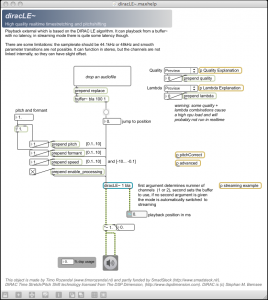 When i studied granular synthesis I delved into the realms of theorem for a while (pretty crazy down there) and was very excited to see how max could enable a more user interactive way to manipulate sound as I’d heard with Kyma and Ableton live – sampler. Our introductions to Max patch writing didn’t cover those details so I’m pleased to find a good patch to study as a basis for further building upon and developing higher level questions as well as helping me to concrete understanding of the basic principles at the same time. Only two more days to build the patch have an understanding and relay it. The pitch shift demo sounds too good to be true. The big question is though: is it real time midi controllable? If yes, then i am looking for something like this this since a while. I was eyeballing Autotune Live but couldn’t demo it without iLok (how stupid is that?! ), similar thing for Mu Voice. Both too expensive to buy without try. I ended up buying a Novation Mininova which has real time pitch shift as a kind of side feature of the vocoder. I was planning to get a mini synth anyway, so i kinda got pitch shift for free. Thing is, this m4l thingie here sounds WAY better, and I’d love to have a sleek Ableton Live integrated solution. I am praying for this to be available for windows soon!